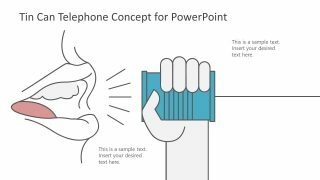 The 4 Step Megaphone Concept PowerPoint Templates contains two slides of loudspeaker clipart designs. It is a business PowerPoint layout displaying megaphone to outshine the announcement presentation. The megaphone or loudspeaker symbolically presents the public messages, spreading warnings, and mass communication. The megaphone as device has evolved over the centuries with one purpose i.e. amplify voices. Therefore, it is helpful in visually displaying events and processes which involves communicating a message around. Such as public announcements, sales, and promotions, alert or alarm etc. It could be, informing people about climate changes. The PowerPoint concept design of megaphone, however, is a four-step diagram to communicate set of instructions. But it can also display warning signs or promote product features. 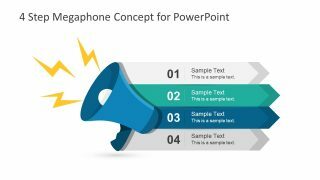 The 4 Step Megaphone Concept PowerPoint Templates sets the environment of expressing opinions and make important declarations. 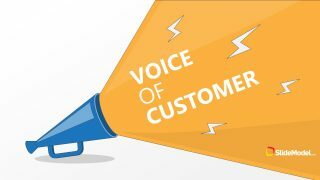 The flat vector graphics display a creative megaphone design as communication theme in slides. 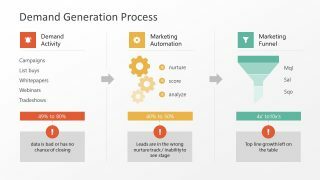 The first slide of 4 step megaphone concept shows four label segments. Alternatively, it could display bullet list points. Similarly, the next slide of megaphone concept shows loudspeaker clipart in the middle and four text placeholders in each corner. This diagram design can help the marketing professionals to make a strategic plan for product promotion. 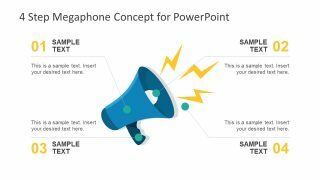 The PowerPoint diagram for 4 step megaphone concept design assists in engaging audience with an appealing graphical content. The use of symbols visually delivers an idea of presentation quickly without effort. It is an editable set of PowerPoint templates with simple blue color theme and no background. In this way, users have many customization options available for personalizing the original PowerPoint template. For example, changing the background color, pattern, gradient. Or, change the colors in megaphone clipart icons and its four segments. 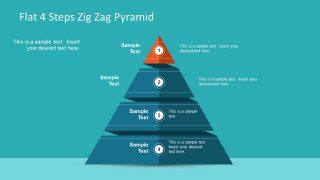 For successful delivery of important messages, consider using the slide template of 4 steps megaphone concept PowerPoint.